SUBHEAD: Lessons from the Edo Era (1603–1867), can help Japan recover from Fukushima disaster. Image above: Katsushika Hokusai (1760-1849) was a Japanese artist, ukiyo-e painter, and print maker of the Edo period. 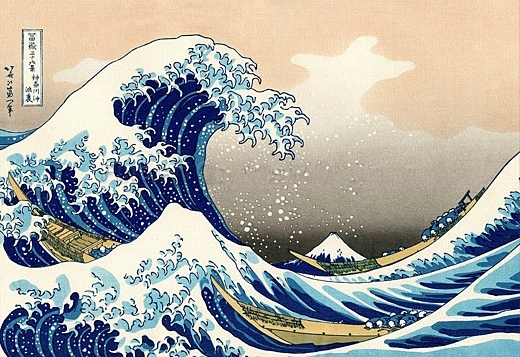 He's best known for his woodblock print The Great Wave. From (http://www.fineartcanvasprints.com/home/size-18x26-22x30/katsushika-hokusai-the-great-wave-of-kanagawa/). After two and a half years, the embattled Japanese government and Tokyo Electric Power Company (TEPCO) — the company responsible for the Fukushima nuclear power plant — have sought the world’s assistance in tackling the three damaged reactors. But Japan’s own not-too-distant past includes many examples of disaster recovery that might be instructional. One of the outstanding characteristics of pre-industrial Japan was a highly developed practical understanding of the natural environment. It’s difficult to call this knowledge “scientific” in the modern sense. Rather, it was a body of lore derived from centuries of experience. This emphasized the natural relationships between forest, watercourse, wildlife and soil, and comprised both advice, rules and taboos. Underlying this traditional approach to forest management was an acute concern for the water system. It recommended villagers make frequent forays into the forest to gather fuel and food and observe the condition of streams, marshes and ponds, understood as necessary for “harmonious coexistence”. Rice crops depended on efficient irrigation systems, and while creating new paddies usually meant clearing forests and constructing waterworks, they were designed to use the area’s natural features and interfere with watercourses as little as possible. Ocean resources were carefully maintained too, with the monitoring of species, seasonal change, and water conditions understood as necessary to maintain the quality and abundance of fish, shellfish and seaweed. But understanding is often not enough to prevent abuse. Two centuries of war in Japan which ended towards the close of the 16th century had left many mountainsides deforested, with the trees cut down to build and rebuild towns and defences. This over-cutting triggered a cascade of serious consequences. Deforested hillsides were unable to modulate rain runoff and snowmelt, which resulted in disastrous flooding. Riverbanks and irrigation systems, carefully tuned to accommodate typical flows, were frequently washed away, and with them the means of food production. Most goods including food, fuel, and building materials were transported by river, and this was also disrupted. It was an environmental catastrophe. In the following decades the newly centralized government enforced traditional methods, and issued guidelines that trees should be planted wherever they were cut. New riverbank earthworks were designed to better cope with periodic floods. Agricultural techniques were refined in regards to water consumption, soil management, and fertiliser use. Environmental degradation can never be reversed quickly, but by the end of the 17th century these well-integrated practices had supported significant population growth while also improving food production, housing quality, clothing, health, and access to education — all measures usually associated with a rising quality of life. If it seems too good to be true, in a way it was. While this extremely sustainable culture continued for more than 250 years, the practices were gradually abandoned after industrialization and the development of a large import-export economy. What the Japanese accomplished economically in a short time — twice; once after US gunboats opened the country to the outside world in the 1850s, and again after 1945 — is a remarkable success story. These changes need not have meant abandoning the old sustainable ways, but that’s what happened. From the 1970s, concerted efforts were made to address industrial pollution and the effects of agrochemical use on the country’s rivers. By the eve of the Fukushima disaster in March 2011, many rural communities in Japan were able to boast that they were reviving and adapting traditional, sustainable forestry, watercourse and agriculture practices to contemporary needs. Fukushima Prefecture led the way, and the village of Iitate — now in the abandoned contaminated zone — was a notable success story held up as a model to others. While we should not dismiss entirely the health effects of breathing soot from wood-burning fires, the pre-industrial Japanese simply did not create large-scale pollution. Even major rivers, such as the Sumida which served the capital city of Edo (now Tokyo), remained clean enough to drink, or at least brew tea, until the mid-19th century. While the contaminants released by the Fukushima Nuclear Power Plant were unknown to Edo-era Japanese, they may well have been able to grasp the role of the waterways in collecting and transporting them. Numerous radionuclides have been released by the accident, with cesium-134 and cesium-137 of greatest concern. The forest canopy captured much of what was dispersed by air, from where it will drop with leaves to the forest floor, enter the soil and into the roots of plants, and be passed on into new leaves, flowers and fruit. Radionuclides in nuts, fruits and berries eaten regularly by animals can persist in their flesh for decades, while the proportion excreted reenters the soil to rejoin the cycle. Cesium-contaminated soil or plants that ends up in forest streams is distributed somewhat unpredictably. Some will seep through the riverbed into nearby plants, some is consumed by insects or fish, and most is carried to the ocean where it is eventually dispersed by currents or falls to the seabed. Contaminants are constantly washed downstream, so that ocean fish may consume cesium washed down from mountains dozens or even hundreds of miles inland. The same interdependence of trees, water, plants, and animals that the pre-industrial Japanese understood so well is now the delivery mechanism of many potential long-term poisons. The severity of this environmental disaster lies not so much in the quantity of contaminants, but the fact that they have essentially hijacked the country’s life-support system. Scientists, engineers and volunteer groups like Safecast (of which I am a member) locate and remove these widely dispersed radionuclides. While there have been successes and cause for optimism, most of us look at the forests in despair. It has been seriously suggested that Fukushima’s forests be cut down in a controlled manner, the forest floor remediated, and new forests planted. If this seems excessive, it’s essentially what Japan’s Edo-period forebears did. As then, the benefits would not be seen for generations. Does Japan have the patience and long-term vision necessary to see through this kind of plan? Possibly not. But the radioactive contamination problems will be with us for decades at least. And until we can heal the forests we can’t heal the watercourse, and until we do that, the environmental hijacking will continue.